Looking forward to purchasing a new projector? Various newly launched Short Throw Projectors are trending all over which will surely make up all your requirements ranging from Classrooms to business meetings to the exciting gaming experience. One of the many excellent aspects of having a Short throw projector is that they cost quite less as compared to the normal ones. You might be thinking When to use a short throw projector? Well, if you have more of meetings or presentations, or even for classroom studies too – having a short throw projector will make all your work much more accessible. The Optoma GT1080 1080p 3D DLP Short Throw Gaming Projector comes with 111 inches from 4 feet distance screen size along with 166 inches from 6 feet distance. The contrast ratio is 25,000:1 whereas keystone correction is also available. The device supports 2 HDMI with MHL, Audio Jack, USB, 3D sync and a 12 V trigger. The higher contrast ratio delivers HD resolution and gamers are inevitably going to love it. Various essential gaming gear can be easily connected and equipped with this short throw gaming projector. The excellent audio plug allows you to have the best quality audio along with various other additional features. The manufacturer is offering a 6500 hour-long lamp life so now, when you play games, do not worry about the projector, go on playing. Gaming Projector: Along with various other tasks, Gaming is the best thing which can be enjoyed most with the Optoma GT1080 1080p 3D DLP Short Throw Gaming Projector. So gamers now buckle up to play some awesome games. Screen Size: The screen size range starts from 111 inches from 4 feet and 166 inches from 6 feet. Contrast Ratio: The contrast ratio of the display is 25,000: 1 along with 2800 ANSI Lumens. Keystone: The keystone correction is available, but there is no shift lens offered by the manufacturer. Connectivity: All the latest connectivity options are included in this short throw projector to connect it with your gaming gear. Ports: There are various ports including 2 HDMI, MHL v 1.2, 3.5mm Audio Jack, 3D Sync, USB and a 12V Trigger. Parts Warranty: The manufacturer offers one-year limited parts warranty along with 90 days warranty on the lamp. Visibility: With innovative design, the Optoma GT1080 1080p 3D DLP Short Throw Gaming Projector offers improved High Definition display resolution. Color Technology: This gaming short throw projector, the manufacturer has included Brilliant Color Technology and hence offers exceptional results. Dynamic Black: The lamp output can be easily adjusted to get the desired output. With brighter scenes, you will get amazing results. The Optoma GT1080 1080p 3D DLP Short Throw Gaming Projector is best suited for all the favorite games and those gamers who are so crazy about them. This short throw projector will deliver the best output with its powerful 10-watt audio and 12-volt output. The 6500 hour-long lamp life makes this projector even better. Equipped with multiple essential connectivity features are also an add-on. One more short throw gaming projector from Optoma – Optoma GT1080Darbee 1080p 3000 Lumens 3D DLP Short Throw Gaming Projector is at out number 2. Lots of advanced features included in this fantastic gaming short throw projector makes it larger than life. One of such functions is DarbeeVision Image Processor. It offers a full 3D resolution with 100” image from less than 4 feet distance. We are also getting an 8000-hour lamp life and sRGB display profile also. Through such most amazing functionalities, gamers are inevitably go crazy. To enjoy enhanced 3D gaming, the Optoma GT1080Darbee 1080p 3000 Lumens 3D DLP Short Throw Gaming Projector is a perfect choice. For all types’ games, this short throw projector delivers 28,000:1 contrast ratio. Easy Placement: With 0.49 throw ratio, this short throw projector can be placed almost anywhere including Coffee table, TV stand, Entertainment center, etc. Gaming Mode: The Optoma GT1080Darbee 1080p 3000 Lumens 3D DLP Short Throw Gaming Projector offers enhanced gaming mode and lets you on the top while playing high-end games with your friends. Excellent Detailing: With integrated DarbeeVision image enhancement technology, you are going to get mind-blowing detailing of skin tones, textures, reflective surfaces. Multi Connectivity: You can easily connect the short throw gaming projector with any of your gaming consoles, Google chromecast, Amazon fire stick, Apple Tv, HDMI Devices and more. HD: Full HD 1080p and 3000 lumens ratio delivered by the projector makes horror games even more horrible and exciting to play. Distance: Huge sized image, i.e., 100” image from a lesser distance like 4feet can obtain in high definition. Response Time: Merely 16ms response time is quite impressive for extreme gamers to keep them ahead of everyone else. DriveImage: Through the GT1080 DarbeeVision Image Processor, you will get enhanced detailing of each character along with their improved lighting, depth and object separation at great detailing. Accuracy: We are getting sRGB display profile dazzle along with REC.709b Color Accuracy. It will deliver the best results when connected with PC, Mac or any of the sRGB compatible devices. The Optoma GT1080Darbee 1080p 3000 Lumens 3D DLP Short Throw Gaming Projector is the successor to the Optoma’s previous GT1080 Short Throw Gaming Projector. With amazing 0.49 throw ratio, the short throw projector delivers the best results for smaller places. The DarbeeVision image enhancement technology provides the best resolution when connected to your PS4, Xbox, PC or any other compatible devices. Here we have a full HD 1080p along with 16:9 3200 Lumens Home Theater projector from View Sonic. 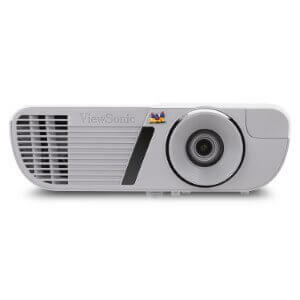 It is ViewSonic PJD7828HDL 3200 Lumens 1080p HDMI Home Theater Projector which comes with Vertical Digital Keystoning. We are getting a 110 inches screen size from 12 feet distance and a 288 inches screen size from 24 feet distance. For high definition presentations and meetings, this short throw projector will deliver the best in the class result. There is a built-in 10W speaker with 10,000 hours for the lamp in Eco mode, and also there’s 1.3x Optical Zoom. For the light, the manufacturer is offering one-year limited warranty whereas for parts and labour the ViewSonic PJD7828HDL 3200 Lumens 1080p HDMI Home Theater Projector comes with a 3-year limited warranty. It is easily compatible with Windows devices, Mac as well as Amazon FireTV, Apple TV, Blu-ray Players, DVD Players and much more. Resolution: There is Full HD 1920 x 1080 native resolution offering the best colour results with their exclusive SuperColor technology. Enclosed Compartments: For various connection compartments including HDMI and MHL, there are enclosed ports for safety while not in use. Wireless Dongle: The ViewSonic PJD7828HDL 3200 Lumens 1080p HDMI Home Theater Projector supports wireless HDMI Dongle/ MHL connectors. Throw Ratio: We are getting a shorter throw ration along with 1.3x optical zoom and can be easily set up anywhere in your home or classroom. Mounting Flexibility: There is a full optical zoom delivered by the more mounting flexibility with standard 1.2x optical zoom. Hence there will be no installation hassle with this projector. Amazing Remote Control: Manufacturer is offering a mind-blowing feature called “MyButton” on the remote control which will be able to control up to eight projectors at one place. Brightness: The projector is packed with 3,200 lumens of brightness with a high ambient light spread all over the room delivering memorable eye performance. Blu-Ray Ports: Projector has been designed and given Dual 3D Blu-ray ready HDMI inputs. So there will be no hassle while connecting it directly with Blu-ray players. Speaker: A 10W speaker is delivering evident quality audible sounds with the best stills results. The ViewSonic PJD7828HDL 3200 Lumens 1080p HDMI Home Theater Projector with SuperColor IPS Match, 3,200 Lumens of Brightness, Discreet Wireless Streaming, Full HD 1080p Resolution – is a remarkable projector. On top of that, Dual 3D Blu-ray ready HDMI ports are even more impressive. The user-friendly design and sleek white chassis make it look classy and will make your place look even shinier and elegant. The LG PF1000UW Ultra Short Throw Smart Home Theater Projector with Smart TV Built-In offers Full HD resolution with up to 1000 Lumens. It is also LG Smart TV Compatible with Magic Remote. Other features also include Bluetooth Sound Out, Wireless Screen Share Connection, and many more. Everyone would surely love the 100-inch screen delivering high definition resolution. While watching movies at home, the LG PF1000UW Ultra Short Throw Smart Home Theater Projector with Smart TV Built-In is going to make you feel like you have the entire theatre brought at your home. Wireless connectivity is also present with Android as well as Windows devices. One can also enjoy Smart TV content through Netflix, YouTube, and many other similar provisions. Distance: With 15-inch length from the wall or screen, this short throw projector offers 100 inches bright and vivid viewing resolution. High Definition: The 1920 x 1080 p Full HD resolution with up to 1000 Lumens is just outstanding even with such simpler device. Smart TV Compatible: This short throw projector is even compatible with Smart TV with Magic Remote. Wireless Connectivity: Various devices including Android, iOS, Laptop, etc. can be easily connected through wireless connectivity features offered by the manufacturer. Bluetooth Compatible: Whenever you feel like listening to songs through the high-end music system, connect it with the Bluetooth sound out and enjoy all your favourite tracks. Short Throw Projection: Coming on to the distance, with 4.3 inches there are 60 inches whereas for 15 inches there are 100 inches sized display offered to us. LED Illumination: Such amazing results being obtained from the LED bright bulb which comes with 30,000 hours estimated life. Connectivity: Along with various other connectivity features, we are also getting USB Connectivity for more straightforward connection with any of the compatible devices. The LG PF1000UW Ultra Short Throw Smart Home Theater Projector with Smart TV Built-In with multiple latest functionalities added, offers best in class performance, especially with the screen resolution. The Full HD resolution with 1000 Lumens and brighter vivid colours makes it even more fantastic. When you have such latest yet more straightforward short throw projector, gaming as well as watching movies becomes even more exciting and fun. 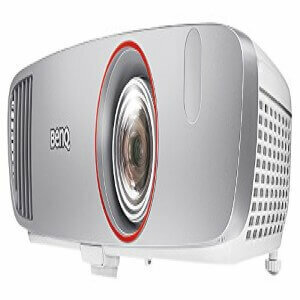 The BenQ HT2150ST 1080p Home Theater Projector Short Throw is at our #5, and it specialises for Gaming, Movies, and Sports. It delivers 1080p full HD resolution along with 2200 ANSI lumens and an excellent contrast ratio. This short throw projector even has 6x RGBRB colour wheel delivering fantastic gaming results. While placed at a 1.5-meter distance, it gives you huge 100” sized screen with high contrast and extreme brightness. Also, there are 10W in-built speakers which will give you Hollywood sound effects through the BenQ Cinema Master Audio. With images, there will be no ageing problems or not even model decay. Gamers are going to love the ultra-fast response time with the intensely smooth gaming supported by this short throw projector from BenQ. True Colors: Your favourite movies are going to get extreme emotions with their joy, sorrow, romance, thrills and action scenes with Rec.709 HDTV Standard colour coverage. Colour Accuracy: As we mentioned, the Rec.709 is international HDTV Standard. It ensures the authentic colours and best results for excellent picture quality. CinematicColor: No matter how extreme gaming you play, you are going to get the most accurate and enhanced quality images with this fantastic BenQ short throw projector. Projection: The device offers the best short throw projection of 100” big sized screen from 4.9 feet distance. Response: The projector comes with Microsecond DMD response time along with 16.67ms Low input lag. Throw and Zoom Ratio: There is 0.69 ~ 0.83/ 1.2x zoom ratio along with a superior throw. Sound: Two inbuilt 10W powerful sound delivered through dual speakers provided by the manufacturer. Connectivity: Two HDMI ports are given for easier and better connectivity options. Picture Mode: Variety of picture modes including Bright, Vivid, Cinema, Game, Bright Game, ISF Night, ISF Day, 3D and many more included. The BenQ HT2150ST 1080p Home Theater Projector offers intense yet smooth gaming features through their various picture functionalities. To deliver high-end audio combined well with HD resolution images, this short throw projector is quite compatible with almost all the Windows, Android, and Mac devices. DMD Response time provides unmatched quality extreme quick response and keeps your game up to speed. The Sony LSPX-P1 Portable Ultra Short Throw Projector has some impressive features related to display images. It lets users display images on Table, Wall, Floor, etc. as per your choice. Almost any devices including your Smartphone, Laptop, Blu-ray player, can be connected and you can start images or video playing practically anywhere, anytime. The manufacturer has also offered a dedicated app through which you can control the Sony LSPX-P1 Portable Ultra Short Throw Projector from your smartphone. So, you can swipe your fingers over your smartphone screen and manage the projector menus on the go. 720p resolution images delivered through SXRD panel. Moreover, there is a portable battery given with which 2 hours battery backup can obtain. 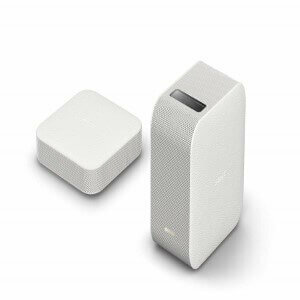 Portability: The Sony LSPX-P1 Portable Ultra Short Throw Projector can be used to play images or videos on the wall, on the table, on a floor or wherever you are sitting, you can start using it. Lens: The manufacturer has used their Ultra Short Throw Lens through which all these features related to playing the device ANYWHERE can obtain. Screen: You can start watching your favourite videos with a huge sized screen ranging from 22” to 80” by placing the short throw projector to different angles. Dedicated App: You can even manage/ control the projector through your smartphone as Sony also offered a dedicated app. Hence the device can be connected to your smartphone with a few swipes. Sound: Superior quality sounds given through their xLOUD technology, dedicated primarily to deliver higher volumes with cleared sounds. In-Built Battery: This batter can be used up to 2 hours, and you can watch your favourite movies or videos from wherever you are. Connectivity Features: Starting from your smartphone, laptop to cable box, blue-ray player, etc. can be connected with various connectivity options given in it. The Sony LSPX-P1 Portable Ultra Short Throw Projector considered amongst widely preferred ultra short throw projectors. Due to its portability and ease of use, it has chosen by numbers of customers. Its lightest ultra short throw lens does all the smart work to deliver the best images and videos in HD quality. With 4000:1 contrast ratio and SXRD panel make sure that all your games and videos get played in high contrast ratio. Moreover, an inbuilt battery is an impressive additional feature. The LG Electronics PH450UG Short Throw LED Projector can set at a just 3-inch distance from the screen, and you can obtain excellent picture quality. 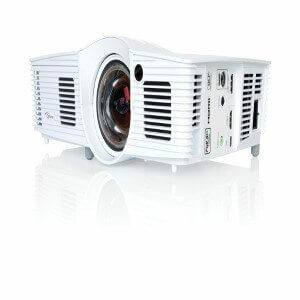 The image size up to 80” can be viewed with this short throw projector. It comes with unique features such as Wireless Screen Share Connection. In that, you can easily connect the projector with any of your Android of WiDi devices and operate quickly. The lamp life is approximately 30,000 whereas comes with Lumens up to 450. The battery life is up to 2.5 hours and can run for this duration while you are enjoying your favourite movies, games or slideshow. Other features include Bluetooth Sound Out which is a relief for music lovers. HD Resolution: The picture quality is 1280 x 720 pixels and gives High Definition results for videos, pictures, slideshows, etc. Distance: To place the LG Electronics PH450UG Short Throw LED Projector, you need space approx. 13 inch far from the screen. Screen Size: While placed accordingly at a 13-inch distance, you can obtain 80” sized display as well as 40” sized display while situated at a 3-inch length. Wireless: It can share screen wirelessly through DNLA, Miracast, WiDi and more. Sounds: This short throw projector offers Bluetooth sound out and can play all your favourite tracks while connected wirelessly. Lamp Life: the Superior quality lamp offered inside the device which will run up to 30,000 hours and deliver best in class results. Ultra Short Throw: This short throw projector is amongst latest ultra short throw projectors, and hence it delivers impressive results even when placed nearby the screen. Display: DLP display offers high contrast images and vivid viewing angle while playing high-end games. Power: This ultra short throw projector has a power consumption of 55 Watt. Embedded Battery: The projector comes with an embedded battery which will run for about two hours on a mere half hour charge. 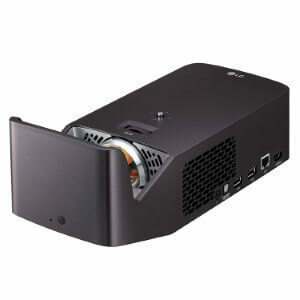 The LG Electronics PH450UG Short Throw LED Projector with ultra short throw projection at just 3 inches away of the projection surface delivers 40 inches screen size. With more distance, the screen size can also be increased, and with DLP display, one can get the desired output with brighter quality pictures. Impressive features such as Bluetooth Sound Out, Wireless Screen Share, etc. makes it a standout short throw projector. 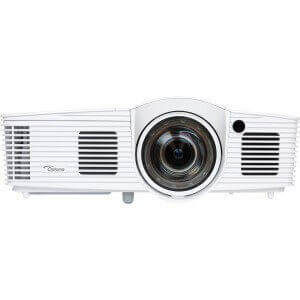 The Optoma EH200ST Full 3D 1080p 3000 Lumen DLP Short Throw Projector comes with 100” diagonal sized image while placed at 3.5 feet distance. Latest digital connectivity features offered along with faster response time. HDMI port with MHL enabled is also given to connect your smartphone or even tablet directly with the projector. The contrast ratio at 20,000:1 provides excellent and stunning video results. It also has got VESA 3D sync port, and computer compatibility including UXGA, SXGA, WXGA, HD, XGA, SVGA, Mac, and VGA supported. 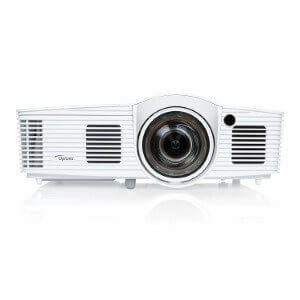 The throw ratio of the Optoma EH200ST Full 3D 1080p 3000 Lumen DLP Short Throw Projector is 0.49:1. Right to life colours and higher contrast ratio makes this short throw projector an impressive model. DLP Technology: With this latest technology, this short throw projector offers razor sharp pictures and lets you enjoy all your favourite movies and games at the fantastic quality. Screen Resolution: BrilliantColor provides around 6-colors procession and produces accurate as well as vibrant and sharp colours. Video Performance: Through the DLP chip, it delivers super fast response time up to 10 microseconds and also supports 144 Hz refresh rate. 3D Compatibility: Various 3D sources including 3D Blu-ray players, 3D broadcasting, latest gaming consoles, etc. are entirely compatible with the Optoma EH200ST Full 3D 1080p 3000 Lumen DLP Short Throw Projector. Flicker Free Images: Due to higher, up to 144Hz, fast refresh, we can get ultra-smooth and sharp flicker-free images. Clear Text: As this short throw projector offers 1080p high-resolution display and vibrant colours, you can conveniently use it for classroom presentations as well as meetings. It provides sharp graphics and clear text. Speakers: The manufacturer is offering built-in speakers with two HDMI ports for setting up more comfortable and quicker. Secure Connectivity: The device can also easily connect to your smartphone or tablet through the MHL. Audio: Audio features include powerful 10watt audio along with quiet whisper operation. Eco+: Through the Eco+ technology used in this short throw projector, we are getting ultra long lamp life. The Optoma EH200ST Full 3D 1080p 3000 Lumen DLP Short Throw Projector with BrilliantColor Technology gives your videos and graphics a sharp and at the same time, smooth picture quality. Various 3D sources are also compatible and can be run smoothly on this short throw projector. Thanks to all the latest connectivity features, your smartphone, tablet, etc. can be easily connected and you can start a slideshow, presentation, video playing anytime anywhere. The Epson Home Cinema LS100 3LCD Ultra Short-throw Projector has some unique features. One of such elements is ultra bright laser technology. The thick black contrast ratio is up to 2,500,000:1 which offers unbelievably black and sharp vivid colours. With advanced 3-chip design, 3LCD technology gives no rainbow effect as well as no white segments in between the images. 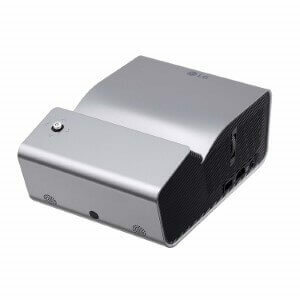 This short throw projector is a class 3R laser product with 37.5mW power output. You might be wondering, How to install a short throw projector? Well, it is an entirely more straightforward job with offered 3x HDMI Ports. Hence it this short throw projector can be easily connected with desired devices through a single hub. You can connect it easily with gaming consoles, satellite box, cable box and so on. You can use it for your daily sports, concerts, movies, videos, etc. enjoyment. Portable: You do not need to have any tangled wires or cables with your projector now, it is because this portable short throw projector is a simple and trendy technology for your projection needs. 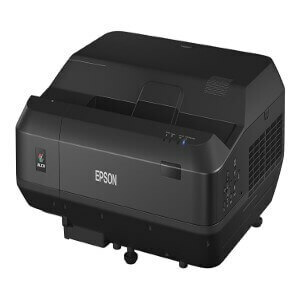 Epson Laser Technology: It delivers impressive 4,000 lumens of colour/ white brightness with excellent quality images results. Contrast Ratio: Unbelievable Deep Black Contrast Ratio you to 2,500,000:1 is given for ultra smooth images viewing experience. HD Resolution: Full HD picture quality with 10’ diagonal brighter and vivid images can obtain with the all-new Epson Home Cinema LS100 3LCD Ultra Short-throw Projector. Projector Life: For normal usage as per 4 hours a day, it can be used for about 20,000 hours and comes with a two-year limited warranty is also offered by the manufacturer. White Brightness: Through 4,000 powerful lumens of similar colour and white brightness, it delivers colour brightness along with ON/OFF plus instant. Advanced Design: A 3-Chip advanced design with 3LCD technology also given for eliminating colour wheels, white segments, and rainbow effects. Easy Installation: Unlike other complex installations, with this short throw projector, all you need is to connect via HDMI output ports, and with a single hub, you can efficiently manage multiple devices. The Epson Home Cinema LS100 3LCD Ultra Short-throw Projector is given a two-year limited warranty and is a class 2 laser product. Max output is around 37mW. Even without a real screen, this short throw projector helps to view all your desired videos and movies on the go. HDMI ports make it even simpler to connect any of the compatible devices with the projector. 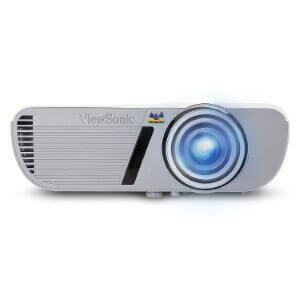 The ViewSonic PJD5553LWS 3200 Lumens WXGA HDMI Short Throw Projector is a perfect short throw projector for education as well as business purposes. It can use for classroom presentations, learning projects, meeting presentations and will deliver useful results. When placed at around 4feet 2 inches it provides 120 inches wider screen projection. Do you think that How short throw projectors work? It works quite easily after simple installation. With simple setup and control, you can quickly plug and play your presentation/ project/ slide show and impress everyone. The particular mode also gave which if used, provides extended life to the lamp. Numerous devices can be connected and used with this short throw projector, on the go. Design: This short throw projector comes with the innovative smart design. It has cable management hood which can easily hold cables when not in use. Also, easy access lamp door on the top ensures the lamp safety. SuperColor: The SuperColor technology offers exclusive 6-segment colour wheel design along with dynamic lamp control abilities. Best Results: Through this technology, you can make your projects come alive in both white as well as dark environments, without compromising image/ stills quality. Connectivity: Variety of latest connectivity features including HDMI, Direct 3D Blu-ray player connectivity given. Balanced Color: With this ViewSonic PJD5553LWS 3200 Lumens WXGA HDMI Short Throw Projector, we are getting five unique view modes. For various modes, different settings and features are given. 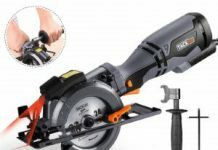 Impressive Warranty: Unlike other similar such devices, we are getting three-year limited parts as well as labour warranty. Along with that, the manufacturer is also offering one year warranty with lamp and first-year free express exchange service, etc. features. SonicExpert Technology: With this technology, it comes with an enlarged speaker chamber and full 20Hz-20KHz sound range to deliver fantastic sound. 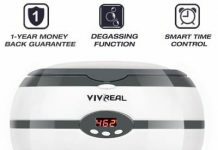 Affordable: Even after offering these many advanced and impressive features, this short throw projector is an affordable product. The ViewSonic PJD5553LWS 3200 Lumens WXGA HDMI Short Throw Projector with industry leading warranty with various parts, lamp and labour – it is quite impressive. Lots of connectivity features with HDMI, VGA, PC, Mac, Mobile Devices are also compatible with it. The smart design of this projector gives easy handling and portability while using it. When to use a short throw projector? There can be a wide range of tasks to use short throw projector, especially for those, with small conference rooms, small classrooms, smaller home theatre space, presentation booths, etc. – the short throw projector would be the perfect thing to have. How to make a short throw projector? With any of the above mentioned short throw projector, you can easily understand how a short throw projector works and other related aspects. What is an ultra-short throw projector? The standard projector is supposed to be kept at a certain distance from the screen whereas ultra short throw projector can be placed quite nearer to the screen even though it will deliver HD resolution. So when you are using an ultra-short throw projector, there is no need to put the projector in the middle or at the end of the classroom/ conference room. Specifically, when you have a smaller space for classroom presentations, slideshow or office presentation – and there is lesser space, using the short throw projector is necessary. It will not only save the area but will deliver impressive results with its short throw projection features.